Australia 7-266 (George Bailey 125*, James Faulkner 39, Darren Sammy 3-48) beat West Indies 212 (Kieran Powell 83, Dwayne Bravo 45, Mitchell Starc 5-32) by 54 runs. George Bailey humiliated the Windies with a majestic maiden ton whereas the lethal bowling from Mitchell Starc and Glenn Maxwell led the Kangaroos to a victory. Australia smashed 266 runs for the loss of seven wickets in the allotted 50 overs and West Indies managed 212 runs before their innings was squeezed with 11.5 overs to spare. 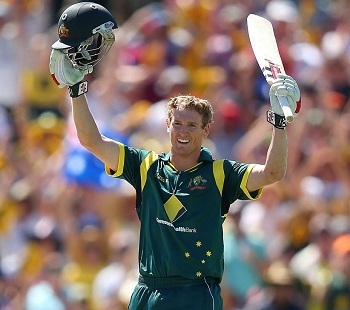 George Bailey (Australia) was declared ‘Player of the match’ for his explosive unbeaten knock of 125 from just 110 balls. The second One Day International of the five match series was played on Sunday, February 3, 2013, at Western Australia Cricket Association Ground, Perth. Earlier, the skipper of West Indies, Darren Sammy, won the toss and offered the batting to Australia. The decision proved fruitful when the hosts lost the first wicket at 16 as Usman Khawaja was gone for three runs and the other opener, Aaron Finch, departed nine runs later for 11. Phillip Hughes and their captain, Michael Clarke, tried to steady the innings and the latter hit 2 fours in the 11th over. The score was taken to 56 in 12.4 overs when Hughes was caught by Darren Bravo off Sammy for 21 and Clarke was clean bowled by Dwayne Bravo for 16 without any addition to the score. George Bailey and Matthew Wade got together at the crease and stretched the score to 93 in 23 overs. Wade was caught by Sammy at first slip off Sunil Narine and the next batsman Glenn Maxwell departed without opening his account. The Kangaroos were in trouble at 6-98 in 23.4 overs when Bailey took over and was being well assisted by James Faulkner. The pair started picking up the runs aided by occasional boundaries as George Bailey completed his fifty in the 36th over with a couple of fours. Faulkner kept on cruising from the other end and they shared a hundred runs partnership in 20.2 overs. Faulkner lost his wicket for 39 as Mitchell Johnson arrived in the center and Bailey continued his onslaught from the other end. George Bailey thrashed his maiden ODI century with a big six over long-on in the 49th over and murdered Dwayne Bravo for 24 runs in the final over with 3 lofty sixes and 1 four. He remained unbeaten for 125 off just 110 balls with 4 huge sixes and 10 fours, Johnson was at his end with 16 as Australia reached 266 with three wickets to spare after 50 overs. Darren Sammy was the highest wicket taker with three whereas Kemar Roach, Jason Holder, Dwayne Bravo and Sunil Narine shared one wicket each. The Windies had a horrible start when they lost Chris Gayle and Ramnaresh Sarwan at just 10 runs as Mitchell Starc struck twice. Darren Bravo joined in with the opener Kieran Powell and the first hit 3 fours before he was declared leg before wicket off Starc again for 14. The third wicket was gone at 33 in 8 overs as Dwayne Bravo appeared in the center as Powell hit the first six of the innings in the 11th over. Bravo preferred to attack and gathered 13 runs in the 15th over with 1 six and 1 four. The duo started looking dangerous and was sending the ball out of the rope continuously and added another 13 runs in the 19th over with 1 six and 1 four. The first hundred of the innings appeared on board in the next over as Kieran Powell achieved his first ODI half century on the last ball of the 25th over. He punished Faulkner in the 27th over with 4 sweetly timed fours and hit another two in the next over. Things started looking bright for the visitors when Dwayne Bravo was caught behind by the wicketkeeper Matthew Wade off Glenn Maxwell for 45 off 56 deliveries with 2 sixes and 4 fours. The fourth wicket fell at 159 and Kieran Powell became the next victim after seven runs for 83 off 90 balls with 2 sixes and 10 fours. That was the beginning of disaster for the Caribbeans as the home bowlers started picking up the wickets at regular intervals. Sunil Narine was the only batsman who resisted by demonstrating a hurried innings of 24 from just six ball comprising 4 giant sixes as the visitors were bowled out for 212 runs in 38.1 overs. 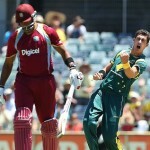 Mitchell Starc was the most dangerous bowler and grabbed five wickets whereas Glenn Maxwell captured four. Australia won the match comprehensively by a margin of 54 runs and leads the five match series 2-0. The third ODI of the series will be played on February 6, 2013, at Manuka Oval, Canberra.